Check out this beautiful new rooftop garden installation which features the beautiful Sumo outdoor planter. The Sumo planter pot is a great modern twist on a traditional planter. This elegant modern outdoor planter pot with its rounded curves makes a very attractive impression in any space. Choose to enjoy them outdoors or in, and see how they add a modern touch to any space. The Sumo planter pot will certainly compliment any outdoor garden, patio design, courtyard or rooftop terrace with its timeless features. If a modern planter or a contemporary planter style fits your garden or home - these commercial grade outdoor planters will be ideal. Inspired European and Asian designs match form and function. Our product line of contemporary modern garden planters pushes the envelope of what a traditional planter should be. With a durable and lightweight fiber cement type of material that can be formed to take almost any shape, you'll always find something unique. The Sumo planter is part of our large modern architectural planter pots that come in a wide variety of styles and finishes. This beautiful Sumo planter pot container holds its own, especially in residential and commercial spaces. The Kyoto planter is available in a variety of different sizes. Kyoto is a versatile planter that works well alone or in groups. Its soft elegant shape makes it a beautiful decorative planter. This modern planter is handmade and imported from Switzerland. This planter is made of natural, a lightweight material that is 100% recyclable fiber cement. Fiber cement ingredients are: cement, powdered limestone, cellulose and synthetic fibers, water and air. 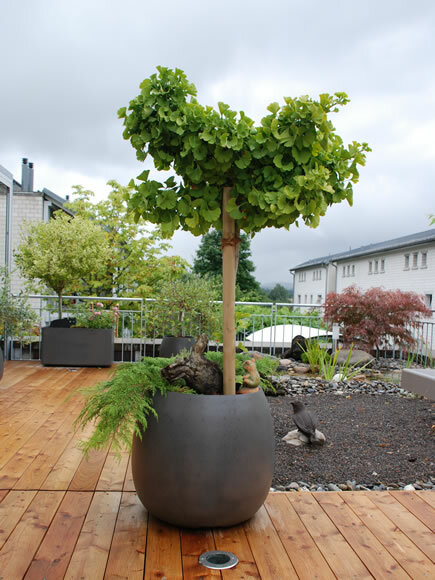 This planter is made of anthracite black fiber cement which is a mostly organic material and it is 100% recyclable. This planter has pre-drilled drainage holes. Designed and manufactured in Switzerland.